Businesses see an opportunity to cash in on an estimated $48.4 billion back-to-college spending season. The registry tradition is fairly new in the U.S. Teens across the country are now applying a tradition once reserved for brides-to-be and expectant mothers to another life milestone: going away to college. Faced with rising costs and more options for dorm decor, thousands of students a year are creating online registries asking family and friends to help complete their shopping lists. Triniti Henry hadn't even decided which college she would attend when she started thinking about all the things she'd need in her freshman year. As she weighed her choices, the 18-year-old compiled a list on her phone of must-haves for transitioning from home to dorm life. "After I was finished I just looked over and I kept scrolling through everything," the Oak Park, Illinois, resident said. "I was surprised at how long it was, how much stuff I need." So she logged on to MyRegistry.com, where she filled a graduation gift wish list with everything from hangers to iPhone speakers. She sent the link to family as part of an invitation to a graduation party. 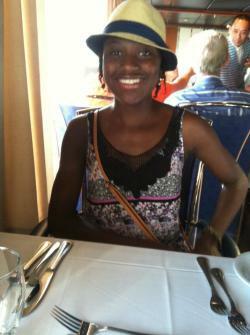 Triniti Henry sent her wish list to family as part of an invitation to a graduation party. The teen's mother said the registry was helpful both for organizing their shopping list and giving family the opportunity to pitch in as she prepares to send her only child to college. "She received scholarships and everything, thank God for that, but with everything else, we just needed that help so we were like, yes we need to do a party and invite people and have them help," Tabitha Henry said. The Henrys aren't alone in feeling the purchasing pinch of going to college. Average spending on furniture, supplies and electronics is expected to hit more than $900 per family this year, an increase of 10 percent from 2013, according to the National Retail Federation's annual "Back-to-College Survey." Businesses, meanwhile, see an opportunity to cash in on what the retailers'group expects to be a $48.4 billion back-to-college spending season. Triniti Henry created an online registry for things she'd need at college, including detergent and an iPhone speaker. "They need so many things and when they make a list it’s good for everybody," said Nancy Lee, president of MyRegistry.com. "It’s good for the retailers because the things get purchased, but they’re not getting hit with returns. ... It’s good for the student because they were able to specify what they wanted." Lee, whose site allows users to register for a wedding, a baby, or create a general registry for an occasion of their choosing, has seen an uptick in registry use by the college-bound. Two years ago, the idea of creating a graduation or school supply page wasn't even on the radar of top executives. Now, she estimates thousands of registries are created for that purpose each year. Target launched its own college registry in June. The site attracted thousands of users in the first month live, spokeswoman Jenna Reck said. Reck attributes the interest in part to the young shopper's desire to incorporate more personal style into their purchases. "On the college side, we’re definitely seeing a trend toward personalization, people not wanting a boring white comforter," she said. "They want a dorm room that reflects their personality." The chance to customize her dorm style -- and hopefully the graduation gifts she'd receive -- drove Christine Campbell to give Target's registry a try. The decorating and interior design fan, who lives in the Philadelphia suburb of Harleysville, filled her site with extra-long sheets, decorative cork-board letters and throw pillows adorned with giraffes, flowers and foxes. 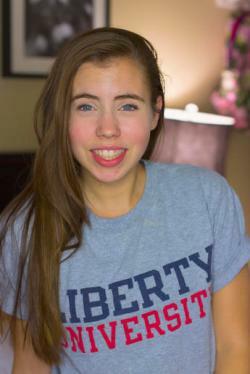 Christine Campbell used Target's registry to organize her wish list for life at Liberty College. She figured creating a college-specific wish list for things she'd need in her first year at Liberty University increased her chances of getting gifts she actually wanted, instead of cash, which she would likely save. Plus, using Target's service, she said, was "not as awkward as sending out a wedding one when I’m not getting married." As someone who came to age in a time of online shopping, Facebook and Pinterest, sharing the link with family and friends felt natural. "We’ve been sharing our whole lives so why not just share something we want instead of you trying to guess what we want," she said. While that view may be common among young consumers, use of registries for college is still a new, and relatively rare, concept. Some caution that asking family and friends to foot the bill for decorations to spruce up the traditionally spartan dorm experience could be seen as extravagant or entitled, especially among older generations. "If you go into a registry and create this category, you might come across as being selfish and a bit arrogant to ask for it," said Lars Perner, a professor of marketing at the University of Southern California's Marshall School of Business. Those feelings may deter people from being the first among a group of friends or family to give the idea a try, he said. But changes in etiquette, and the popularity and ease of online shopping, could lead use to become more common and accepted. "Norms change over generations certainly and certainly this generation is much more brazen than previous generations," he said. "So maybe this is the new norm." The registry tradition itself is fairly new in the U.S. In 1935, Macy's launched what it says was the country's first registry experience, a "Brides House" on the eighth floor of its Chicago store. The section was fully furnished and staffed with "advisor to the bride," intended to "give the bride suggestions on her new home from kitchen to bedroom," Macy's says. The concept spread, with more stores, and later websites, offering services tailored to both for weddings and other less traditional occasions, like getting a dog or finalizing a divorce. "It's gotten almost whimsical," said Barbara Kahn, director of the Jay H. Baker Retailing Center at the University of Pennsylvania's Wharton School of Business. "But this notion of back to school and this milestone of going to college is back in keeping with the original premise." Like starting a new home with a spouse or welcoming a first child, leaving for college has "become an orchestrated shopping experience triggered on this change of life event," Kahn said. Unlike other similar turning points, such as a major move, starting college creates both a purchasing need and a sense of sentimentality. "My prediction is this will catch on because this one does make sense," Kahn said. "You really want to wish the kids a good start. It's a life-changing event and there's just so much of an emotional thing." Lee, the MyRegistry.com executive, believes the ease of sharing and buying items online, as well as shifts in gift-giving etiquette, have also paved the way for the trend. "If somebody wants to get a gift back in the olden days we would smile politely and either return it, regift it or stick it in the closet," she said. "I think people are starting to be more practical." On an even more practical level, the rising expense of school is driving use. That was the case for Triana Rivera. Even with scholarships and GI Bill funds helping cover the Georgia teen's tuition costs at Mercer University, the tab for staples like a comforter and a water pitcher for her dorm fridge added up. "That really sent me in the real world, that not everything my parents can buy," she said of seeing her shopping list. So she created a registry online, filled with basic supplies and a few frills, and and sent it to family who live as far as Colorado and Spain. It wasn't long before her desired items started to arrive, allowing the aspiring chemistry and psychology double major to focus on her dream of becoming a doctor instead of paying for the things she needs. "Actually getting that package at the door," she said. "It made me really relieved that I could rely on a website to get what I wanted."